Designed for use with the Kanga loader, this bucket will get you started on any project. With high tensile steel cutting teeth for long life and digging the most difficult materials. 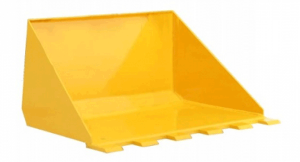 The open bucket shape helps prevent sticky materials from clogging, making it an excellent tool for simply muck shifting from place to place. Bucket volume is sized so that the rated load capacity to the host machine when the brim is filled with heavy materials such as wet sand or gravel. This helps to prevent unsafe operation or overloading. Ideal for everyday use, shifting sand and soil, clean up and backfill. The straight cutting edge of the mulch extension is ideal for scraping floors clean in horse stables, stud farms, animal feed lots and pens etc. The Kanga Rental includes one attachment of your choice at no additional charge. Additional attachments will be charged at the below rate.